In May of 1942, photographer Dorothea Lange shot this picture of the Mochida family, prepared with their family’s identification tags and marked bags waiting to board a bus that would take them to the Tanforan assembly center. Though this photo was part of the censored collection that the military kept under wraps in the National Archives until 2006, this photo is now one of the most recognizable, widely used images to represent the upheaval of Japanese American life. The impact of the internment manifests in how even the smallest and most innocent were affected. Kay Ikuma, who is center third from the left, is now 78 years old. “I think the picture is used a lot because we’re such a big family,” she says. 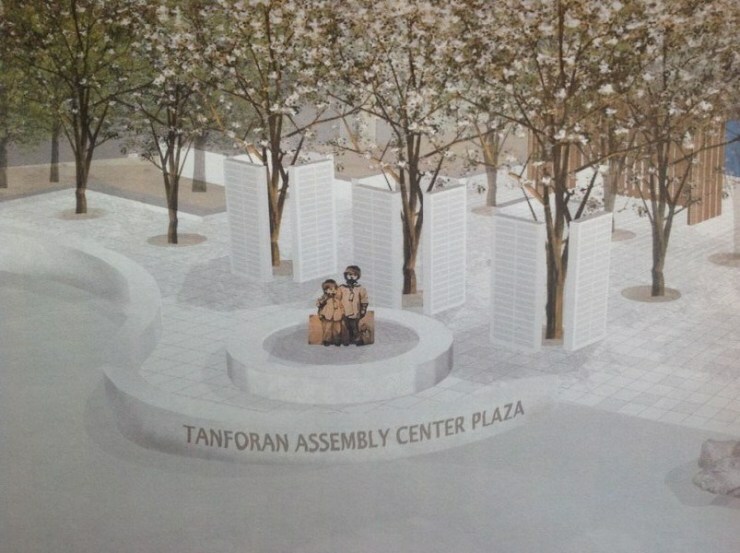 “I have a brother that was born in camp that’s not in the picture.” Two of her sisters, Hiroko and Miyuki, are the inspiration behind the proposed statue to commemorate the assembly center at Tanforan. We were living in Oakland. From there we were taken to Tanforan, and I think we were there under a year, maybe nine months. Then we were moved to Topaz, Utah. They operated a nursery, a flower nursery. I don’t think we owned it, I think we were working for somebody. It’s not that we lost that business but they lost their livelihood. There were neighbors I think who looked after some of our belongings. But my parents struggled, I don’t think they had a lot. No there was nothing like that. And since we’ve been back, there was no conversation. They didn’t want to talk about it, it was done, it was past. I wish I was a little more persistent in getting them to talk about it because they never volunteered anything. Yeah I think that’s pretty common. No we really didn’t do too much of that. My older siblings, they were really hesitant and their feelings were that they had a good time. But nobody wanted to hear that, they thought, so they didn’t want to say, ‘I know this was such a hardship for your family but we really had a good time.’ And the camp people really took good care of the young people. They had schools, they had a lot of activities. They had these sumo tournaments. They’d give out prizes like shoyu and little sacks of rice. Fun things, not a lot of hardship. But my mom was assigned the job of cleaning the laundry room and latrine area, and she would do that at night. I’m sure that was just to earn a little bit of money. Kay and her siblings, photographed by Paul Kitagaki. From left to right: Hiroko, Satsuki, Kayoko, Tooru and Miyuki (seated). Yeah, I think he was in some kind of administrative job. He wasn’t as available to discuss things with as my mother was. He was either gone or–I think the men really got together a lot. I think they suffered a lot. In the Japanese culture, the men are really the head of the households. To be completely beyond their control, they couldn’t take care of their family. I think their pride really suffered. I was four. We were there the whole time, we were the last ones to leave camp. There were a lot of people who left to go back to school. We know a lot of friends that went back to Ohio but our family was in tact, none of us left. We came back to San Francisco and they put us in barracks. Some of those buildings are still there down in Hunter’s Point. I don’t know, we were all so young, everything was done for us. One of the hardest things was getting immersed back into society, like taking the bus to school some place where there was a mixture of people. We had to put up with a lot of taunting, a lot of ridicule. That was hard, I remember that, being teased a lot. Yes, kids in our classroom. Oh Japs. They’d call us ‘Jap’ all the time. “Go back, you don’t belong here,” that kind of thing. If they said Jap in Hawai’i they’d get beat up [laughs]. We had a great time. I remember my mother looking worried. My father became an air raid warden. ‘Hey turn off the light.’ ‘Hey pull those shades down.’ ‘Where do you keep the drinks in the house?’ We used to idolize the older guys, we’d hang around the edges. They would tell me to buy them some sodas. More like lawyers and teachers, higher ranking. There was a Japanese school and they closed that down right away. KI Both of them ended up doing domestic, house cleaning and gardening. My mother would talk with her friends and finally found a place in the Haight, actually. A friend of hers owned it and we rented the bottom flat. Then we ended up moving to a flat right outside of Japantown on Pine Street. And that’s where we lived when we got married. It worked out just like she planned. A bunch of Japanese speaking young men met in the basement of the Chinese church. I think that’s how it started. Then it became a church where a lot of young people started coming right from out of camp. It became a big social thing to connect up with other young people. I think the Japanese were interned due to an irrational fear of sabotage which was fed by racism which already prevailed against the Japanese people. The West Coast was primarily targeted. Those living in other parts of the country were mostly unaware of what was taking place. The racism against the Muslims has gripped the whole country. There is no part of the country which is unaware of what is happening to our Muslim brothers and sisters.“If they’re Muslims, they must have terrorist ties.” What’s very heart-warming to see is how much the “silent majority” is stepping up nationally to say “This is not what America is all about.” I am so embarrassed that the current leader is so clueless and leading us backward. For me, the biggest thing is the effect that the internment had on our parents. The hardship they had to go through, the disruption to family life, the loss of dignity, the feeling of helplessness in keeping their families protected, the loss of so much that they had worked so hard to gain. I think very late in my life because I don’t think I even thought about it when we were going through the process. It wasn’t until after high school I’m sure. I just assumed, when we had reparations, I just assumed it would never happen again. And then all of sudden here we are right in the midst of discussions. I just find it hard to believe.